Firmware is the software code that controls and is embedded in the physical hard drive hardware. It is responsible for the operations of the hard drive and its activities include configuration, management of the interaction that takes place between the other components and the safe powering on/off of the system. At start-up, a hard disk loads the service data from its firmware zone into RAM and then allows the drive to report on readiness. If there is damage to these modules, then the drive will report either it’s family identity or will not detect it at all. In the event of such an occurrence, the computer will be prevented from accessing any data on the hard disk. The benefit to this is that it is merely an accessibility problem and a firmware failure does not automatically incur a data loss. Once the drive has been repaired, it is possible to recover the data. Electronic failure usually relates to problems on the controller board of the actual hard disk. This may be due to the computer actually suffering a power spike or electrical surge that knocks out the controller board on the hard disk making it undetectable to the BIOS. This means that whilst there is an electronic failure, any data stored on the hard drive will be inaccessible until the problem is fixed. The nature of this type of problem however, is advantageous as it is a mere hindrance and data will not be lost or corrupted and is therefore fully recoverable. The circuit board is responsible for powering and controlling the mechanical unit. It is exposed to variations in temperature and as a result, the chips that comprise the circuit board surface can develop small breaks internally which can cause circuit interruption and electrical failure. Furthermore, the failure of any of the other electrical components of the computer can result in a defective circuit board, thus causing the hard drive to fail and data access is then prevented. Mechanical failure is generally considered to be more serious than electronic failure or firmware corruption as it often leads to data loss and even complete data loss if prompt action is not taken. There are numerous types of mechanical failure; these can range from motor problems to one of the most common types of known failures is a head crash. A head crash, as it’s name implies, occurs when the read-write heads of the hard disk collide with the disk’s rotating platter surface. Often, this can cause damage to both the heads and even the hard disk itself. The head normally rides on a thin film of moving air which is entrapped at the surface of the platter. The platter is coated with a magnetic layer and a crash can occur if a small amount of dust, a sudden movement of the computer or power surge causes the head to bounce against the disk and damaging the magnetic coating. Modern drives spin at extremely high speeds (between 4,200 and 15,000 rpm) which means that when such a collision occurs, the damage incurred can be quite serious. Obviously, data corruption will occur at the onset of a head crash as it will then become unreadable when the read-write head attempts to access it. 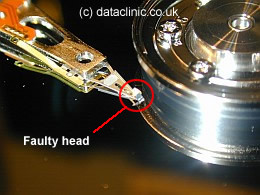 Furthermore, once a head crash has occurred, this increases the probability of future head crashes, especially if there is dust in the system, for instance which means the user needs to take prompt action to rectify this in order to prevent further head crashes and risk losing all data stored on the hard disk. Logical errors also differ from the other failures mentioned as it usually means that there is nothing actually physically wrong with the disk in terms of architectural faults, instead there is a problem with the information stored on it; there could be an invalid entry in a file allocation table for instance. Some logical errors are not too serious and can be tackled with various software tools, however some logical errors can be of such severity that the use of software ‘repair’ tools will in fact exacerbate the problem and make render the data unrecoverable. In a sense it is rare that a hard disk failure could be caused by a human alone. That is, of course providing that users take caution in how they handle a computer. Combined with mechanical failure, human error accounts for almost 75% of all incidents of data loss. All of the previously mentioned hard disk failures could be caused by computer misuse on the user’s part. Computers are very sensitive to changes in temperature, dust and dirt etc entering the hard drive, electrical power surges and knocks and bumps which may occur. Users should therefore take extreme caution to prevent any of these circumstances from occurring as much as they possibly can. Aside from problems that may occur within the hard drive itself or damage that may be incurred on the users’ part, other failures can occur in other parts of the computer which can have a knock on effect to the performance of the hard disk. These problems include IDE cable malfunction, power connector problems and inappropriate BIOS configuration. Each of these problems is explained below. SATA / USB / IDE / Power cable malfunction – Most cabling is cheap and notorious for causing trouble. Cables can turn defective without any necessary poor treatment from the user. It is therefore a good idea to check the cable if any problems seem apparent with the hard drive. Power connector problems – If the power connector is of a poor quality, this could mean that the hard disk is not powered properly or interruptions occur. Again, this can be easily rectified when problems seem apparent in the hard disk by trying out a different power connector of a higher quality. Inappropriate BIOS configuration – It is important that a computers BIOS is configured correctly because if it is not, then it may seem like the hard disk is not working properly. This can be checked by entering the BIOS setup utility and setting the hard disk type to AUTO. This will ensure that the hard disk will be detected automatically when the computer is booted. Although these problems identified will initially make it seem like there is a problem with the hard drive and the user may feel a great deal of frustration as the cannot gain access to the data they require etc, because there is no actual problem with the hard drive no data will actually be lost. Part Three – Methods of Preventing Failure and Data Corruption, or go back to Page One.